Since I wasn’t there 15 billion years ago when (say most scientists) the cataclysmic fireball resulted in the Earth, Sun, Moon, and all the planets, stars, and galaxies, I can’t speak to the factuality of these lines. It might be worth noting that pages 56 and 57 discuss Pluto, “a little planet we still know relatively little about” (wrote the authors in 2000) and which we now know is not a legitimate planet at all (based on a scientifically democratic, or maybe a democratically scientific, vote) but is instead a mere plutoid (according to scientists who can now definitively state that there are absolutely only 8 planets, no matter what anyone said before). Aside from the fact that planetary “facts” have changed in the 12 years since the book was first published – which might call into question the very definition of “fact” – I have little to offer by way of scientific reader-response to the opening In the beginning lines. I’m not a scientist. I do know some scientists, and I could ask them whether my lovely little sewn-binding book about space starts out factually sound, but I’m not sure that’s really the point. The point is that, poetically speaking, the opening lines of the book are atrocious. Big Bang, cataclysmic fireball, the inexorable pull of gravity – it’s enough to make any writing instructor curl up into a tightly wound fetal ball, reduced to meaningless simpering. And just in case she hasn’t quite toppled over the hypothetical edge of literary sanity, there is the equally hypothetical impending Big Crunch. You know. Like the Big Bang. But not alliterative. Please excuse the writing instructor while she chews on glass and pierces her eyes with a fork. Maybe the authors of the space book wanted to draw on the emotional sensibilities of the reader – certainly the inexorable pull of gravity is not a strictly scientific phrase. Maybe they wanted to take a gentle (or not) swing at another poetic account of the Earth, Sun, Moon, and all the planets, stars, and galaxies, an account that begins with the same three words. Sadly, they fail in poetry by their own hyperbolic clunkiness. Ironically, they fail in science (present Plutoidian science, at least) by, of all things, the advancement of science itself. What was a definitive fact just a few short years ago is, alas, no longer factual. Then God said, ‘Let there be light,’ and there was light. Then He separated the light from the darkness. It seems to me that when poetry tries to be science or science tries to be poetry, we run into all kinds of problems. The theologians who insist that the first day definitively, factually, unequivocally, and absolutely equates to a passage of 24 hours are on no more solid ground than the scientists who poeticize the nothingness of eons ago into a non-deistic cataclysmic fireball. Similarly, the scientists who insist that a spontaneous and purposeless big bang is more likely and believable than God’s voice are treading in dangerous waters. There are solidly scientific reasons to believe that the earth is very, very, very old. There are solidly sensible reasons to believe that God – powerful, creative, intentional, and knowable – was the intelligent and powerful source of all creation. These two things are not mutually exclusive. Science and truth can co-exist. Though science can reasonably theorize about the when of the beginning, it cannot speak at all about the who or why. When science has faded away – perhaps in the Big Crunch it so boldly predicts, perhaps in some kind of Plutoidian consensus – truth will still be ever-present, just as powerful, creative, intentional, and knowable as always. At that point, facts and data will cease to exist, swallowed up in the expansively elegant truth known as Love. Can I prove it? Of course not. Can I know it? Absolutely. For though it may not be measurable, Truth is indeed knowable. In the humble (errant) opinion of AARP – who sent me a complimentary trial membership card this past week – I’m now old. Or at least old enough to join the club. Just like that. One day, not even an invited guest. Next day, a card-carrying (trial) member headed (one presumes) straight to the retirement community. After living for a certain number of years – during which each and every day I was turning older than the day before – I’ve learned a few things. 1. Going to camp with middle-schoolers is a blast. Period. No questions asked. 2. College students are profoundly philosophical. They ask all the right questions – and too often receive all the wrong answers. 3. There is always enough time to take a nap. 4. Age has nothing to do with the calendar year and everything to do with the spirit. 5. Parenting is more work than any of the books tell you. 6. Most books on parenting aren’t worth reading. 7. Staying married is more work than any of the books tell you. 8. Most books on marriage aren’t worth reading. 9. Sometimes there’s just no explaining one’s dietary cravings. 10. Relatively speaking, I’ve learned practically nothing. Or: I have a whole lot still to learn. That last one is perhaps the most unexpected twist in this whole growing-up thing: the closer I grow to the Lord and the more I get to know Him, the more aware I become of just how very far from Him I am and just how very little I actually know. The more I encounter His grace the more aware I become of just how little of His grace I’ve actually encountered. The deeper I sink my roots into His love the more aware I become of just how shallow my rootedness really is. The firmer I anchor my life into His strength the more aware I become of just how susceptible I am to a slow and gentle drift. The more I experience significant change in my life the more aware I become of just how much more change needs to happen. The more I am filled with His love the more aware I become of just how empty my soul tends to be. It’s a little bit like discovering that the inside is bigger than the outside, and the farther inside a person goes, the more endlessly expansive it becomes – much like the stable in Narnia’s final days and the manger’s babe in Christendom’s first days. Growing up, it turns out, is not really about growing old. Instead, it’s a lifelong process of discovering just how much more growing up there still remains to do. then (and every other “when”) you must stop and breathe and listen, because God is there, quietly and firmly cradling both the universe and you. 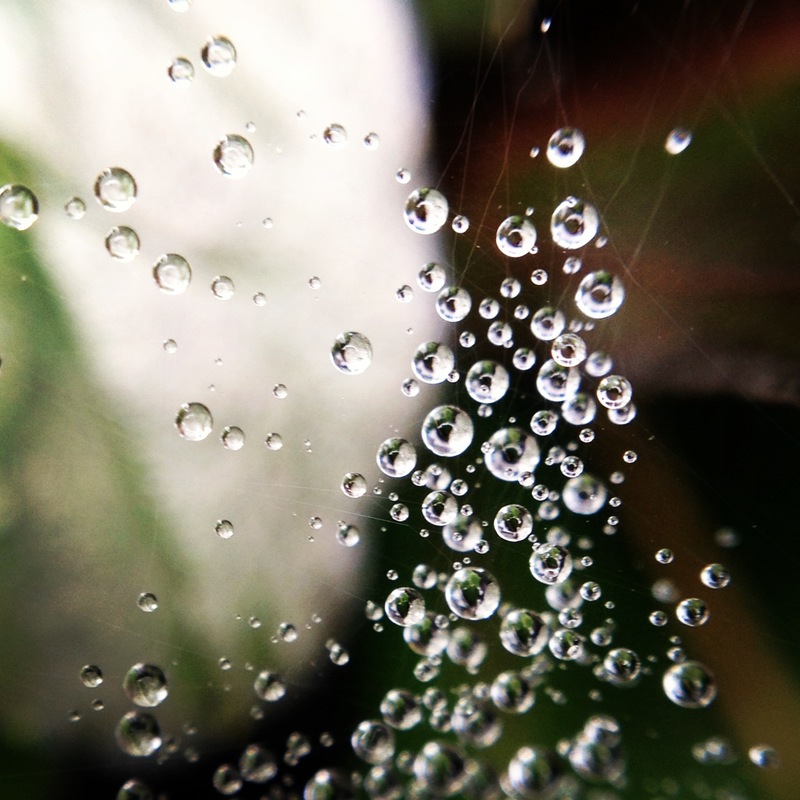 In the overwhelming flood of fear and the tangled web of worry there is (indeed) a cleansing drop of grace resting on a delicate strand of love, if only you will look carefully and listen closely. “Hush, child. No murmurs now. Listen for a moment ( or ten or a thousand) in silence. Listen to My voice – the whisper of truth, the breath of love, the wind of peace. Be still and know. Behold and believe. Believe that I designed you, then knit you together in the depths of love. Believe that I formed you from the source of life, then brought you into being. Believe that you are meant to be. I have heard your cries for help. I have rescued you from the pit. I have redeemed you for new life. I Am. I Am your healer. I Am your savior. I Am your rock. I Am your refuge. I Am your supply. I Am. I Am the Lord your God. I Am your Abba, Father. There is none other. I alone Am the creator and sustainer of all the exists. Of you. If you seek to follow other gods, you will be disappointed and discouraged – they are not me. If you strive to live for yourself, you will be empty and alone – you are not me. I generously offer undeserved grace within unmeasured love – you may have all of Me. I jealously desire an undivided heart within a humbled soul – I do want all of you. When I look at you, I am silenced. I am moved beyond expression. I am amazed and filled with wonder. I spun the sun. I spoke the moon. I placed the stars. I breathed the universe. And it is good. Indeed it is. But you – you – are a wonder to me. You are my child. My beloved. My own. More breathtaking than all of creation. Did you hear? Did you taste? Did you see? Do you know? All is changed for one who believes that you take God’s breath away.